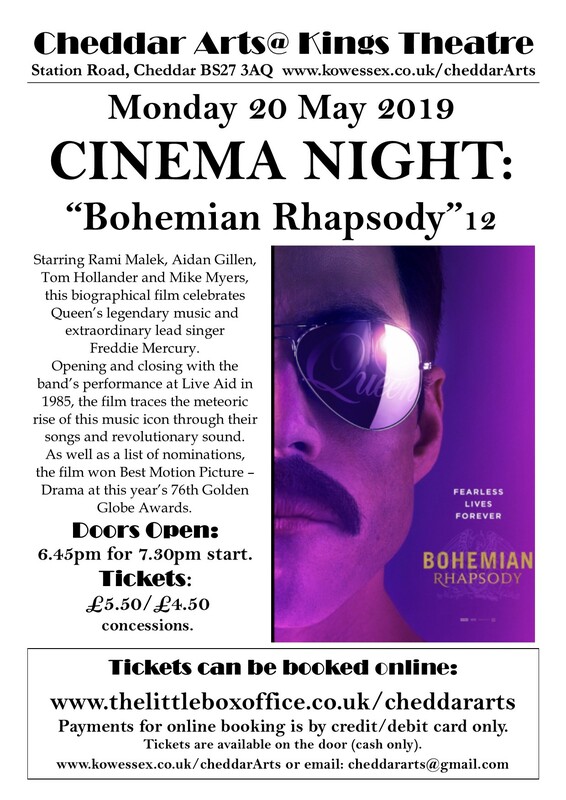 Starring Rami Malek, Aidan Gillen, Tom Hollander and Mike Myers, this biographical film celebrates Queen’s legendary music and extraordinary lead singer Freddie Mercury. Opening and closing with the band’s performance at Live Aid in 1985, the film traces the meteoric rise of this music icon through their songs and revolutionary sound. As well as a list of nominations, the film won Best Motion Picture – Drama at this year’s 76th Golden Globe Awards. Starring Glenn Close, Jonathan Pryce, Christian Slater and Max Irons, the film shows behind every great man there’s a great woman. After nearly 40 years of marriage, Joan and Joe are complements to each other. While Joe is casual, Joan is elegant. While Joe is vain, Joan is self-effacing. 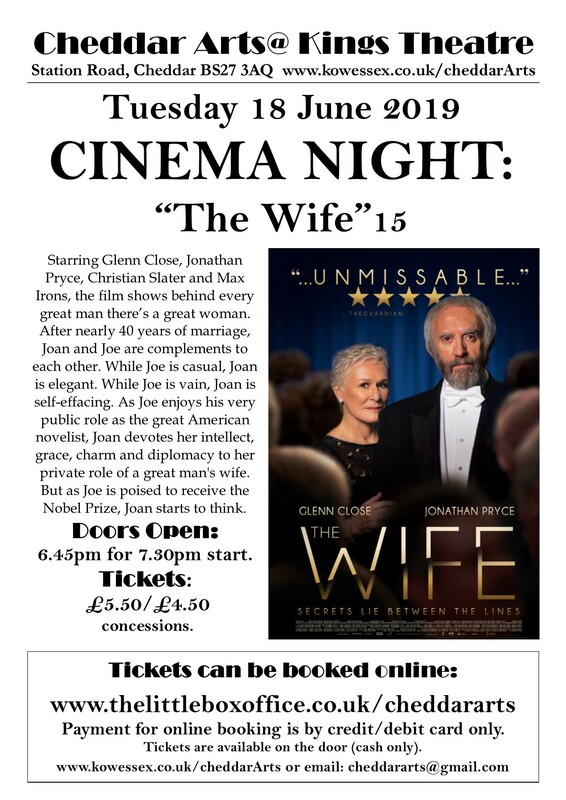 As Joe enjoys his very public role as the great American novelist, Joan devotes her intellect, grace, charm and diplomacy to her private role of a great man's wife. But as Joe is poised to receive the Nobel Prize, Joan starts to think. Starring Steve Coogan and John C. Reilly as celebrated comedy duo Laurel and Hardy. 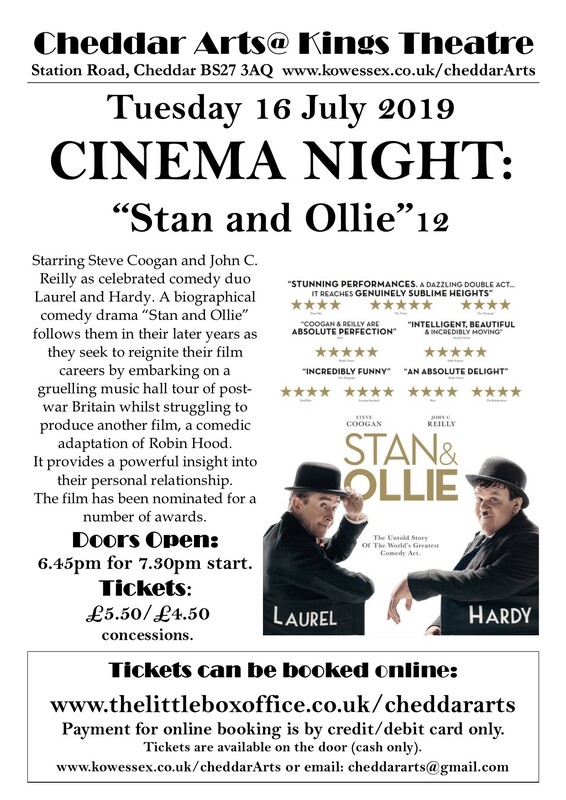 A biographical comedy drama “Stan and Ollie” follows them in their later years as they seek to reignite their film careers by embarking on a gruelling music hall tour of post-war Britain whilst struggling to produce another film, a comedic adaptation of Robin Hood. It provides a powerful insight into their personal relationship. 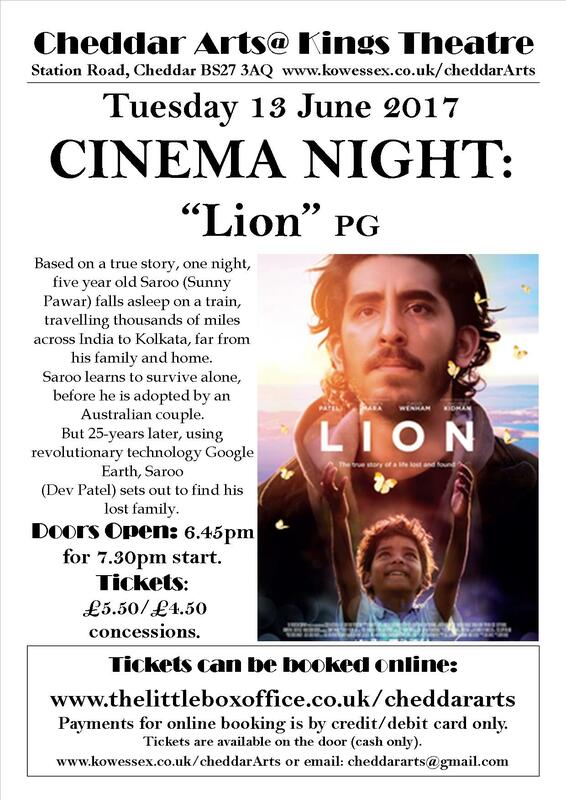 The film has been nominated for a number of awards. 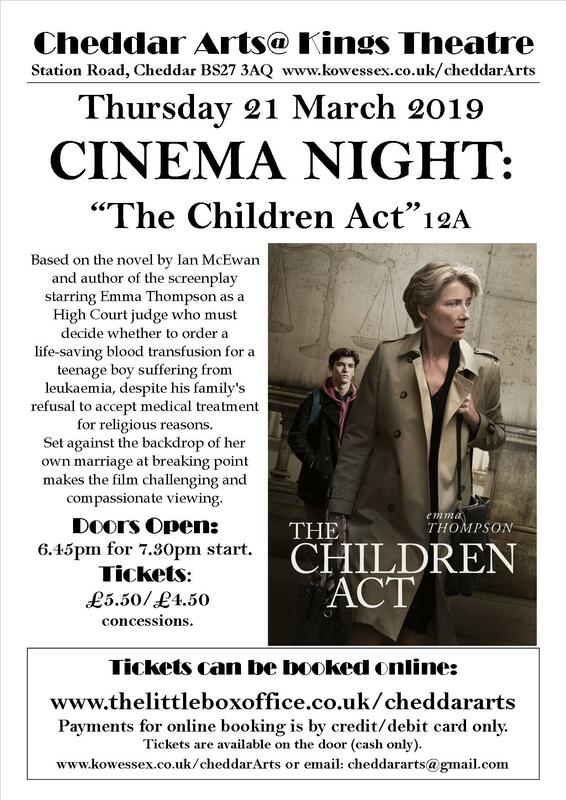 Based on the novel by Ian McEwan and author of the screenplay starring Emma Thompson as a High Court judge who must decide whether to order a life-saving blood transfusion for a teenage boy suffering from leukaemia, despite his family's refusal to accept medical treatment for religious reasons. 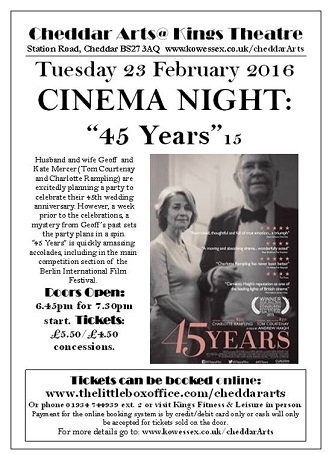 Set against the backdrop of her own marriage at breaking point makes the film challenging and compassionate viewing. 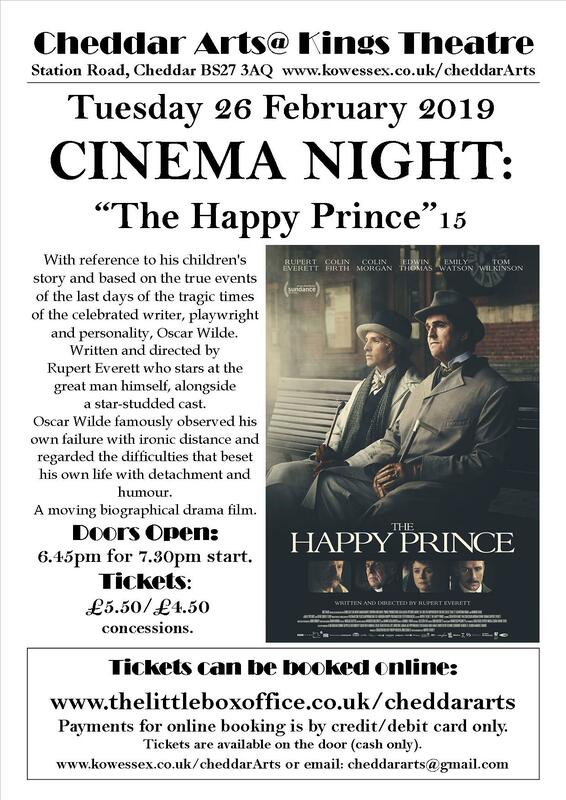 With reference to his children's story and based on the true events of the last days of the tragic times of the celebrated writer, playwright and personality, Oscar Wilde. 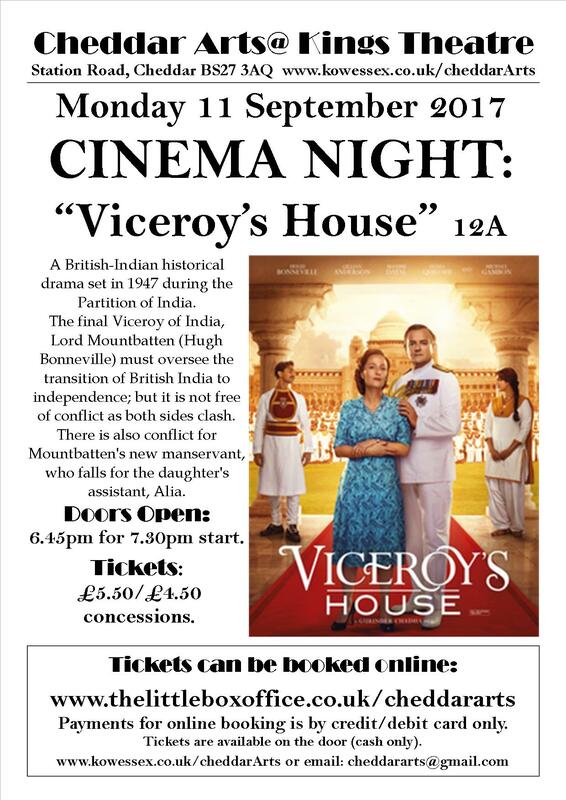 Written and directed by Rupert Everett who stars at the great man himself, alongside a star-studded cast. Oscar Wilde famously observed his own failure with ironic distance and regarded the difficulties that beset his own life with detachment and humour. 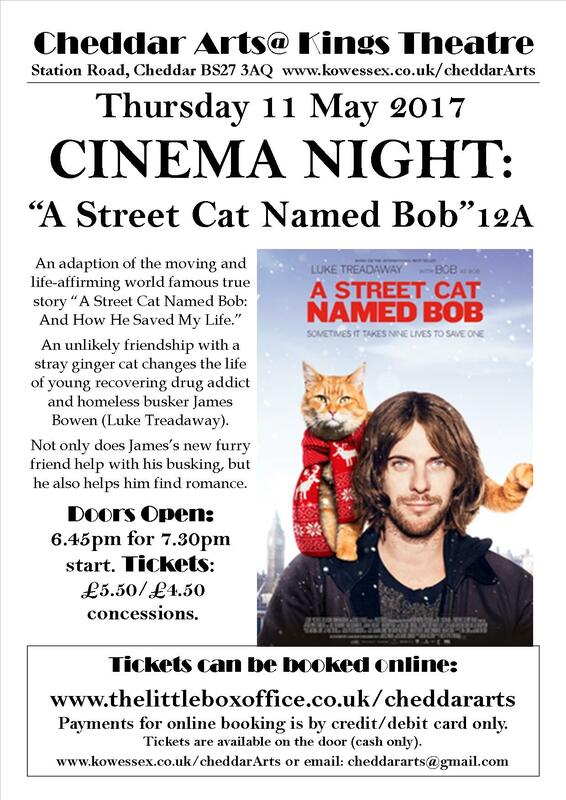 A moving biographical drama film. A rare glimpse into the relationship between beloved children's author A. A. Milne and his son Christopher Robin, who created the magical world of Winnie the Pooh and some of the most-loved and most sold children's books. The family are swept up in the international success of the books and the enchanting tales that bring hope and comfort to England after the First World War. 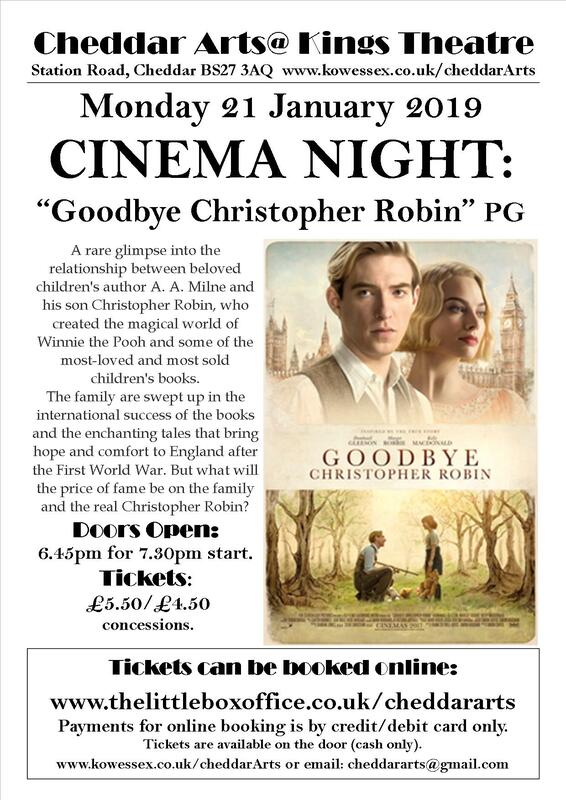 But what will the price of fame be on the family and the real Christopher Robin? Inspired by the ambition and imagination of American showman P.T. 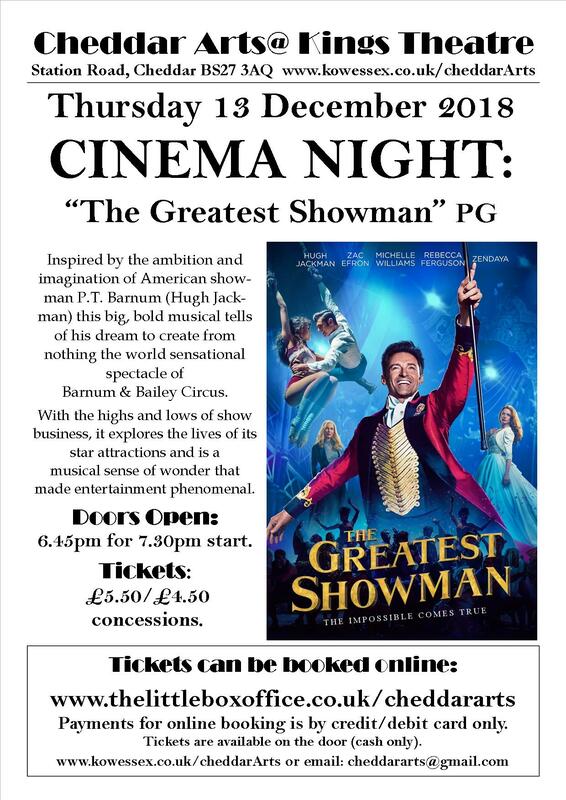 Barnum (Hugh Jackman) this big, bold musical tells of his dream to create from nothing the world sensational spectacle of Barnum & Bailey Circus. With the highs and lows of show business, it explores the lives of its star attractions and is a musical sense of wonder that made entertainment phenomenal. 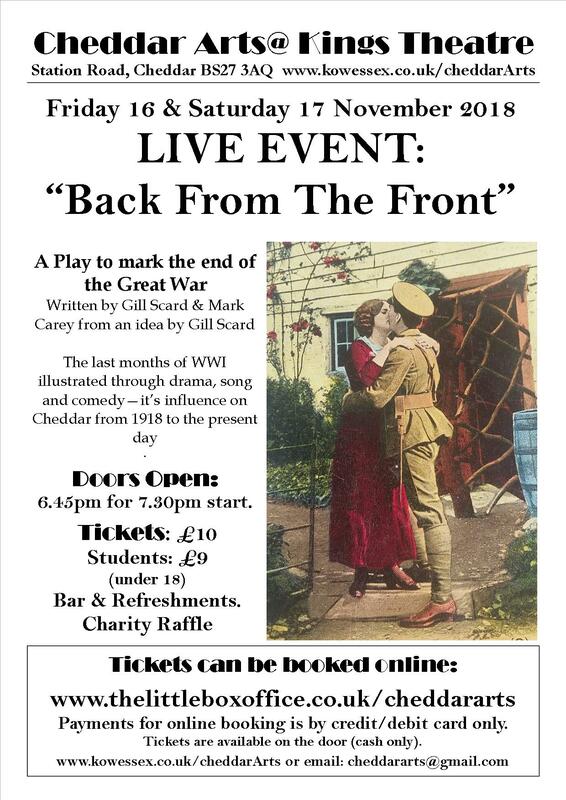 In 2014 Cheddar Arts presented a play to commemorate the centenary of the start of WW1 called "Letters from the Front." 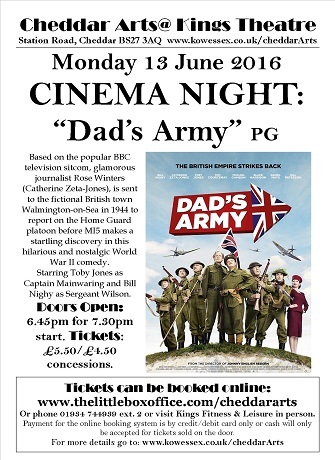 So this year we mark the end of The Great War with an evening of Drama, Music, Comedy & Songs of the Era. 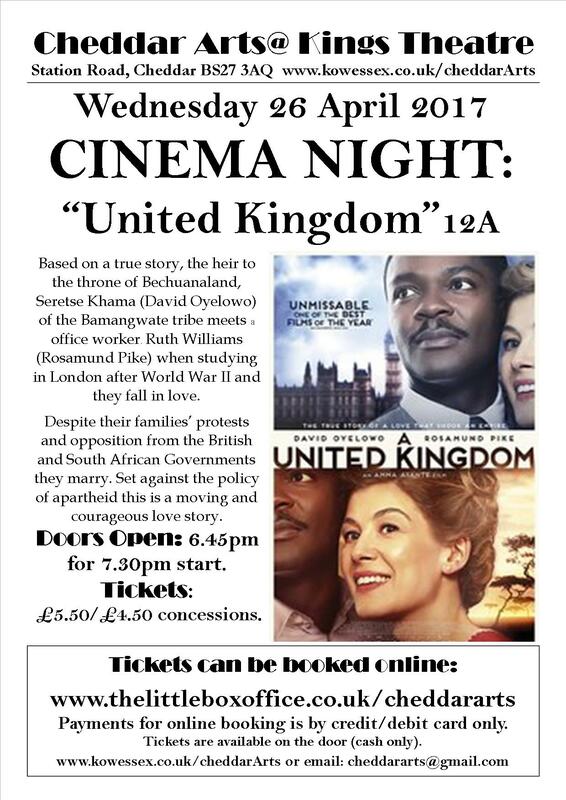 The Play will be full of the history of the turning point of the conflict, & the Local & National figures that were an important influence on those months. Our research team have discovered fascinating stories about Cheddar & it&apos;s residents of 1918. We look at the Businesses, Pubs, Sports Clubs & Shops of the time, how the High Streets looked then & through the Century to the present time. 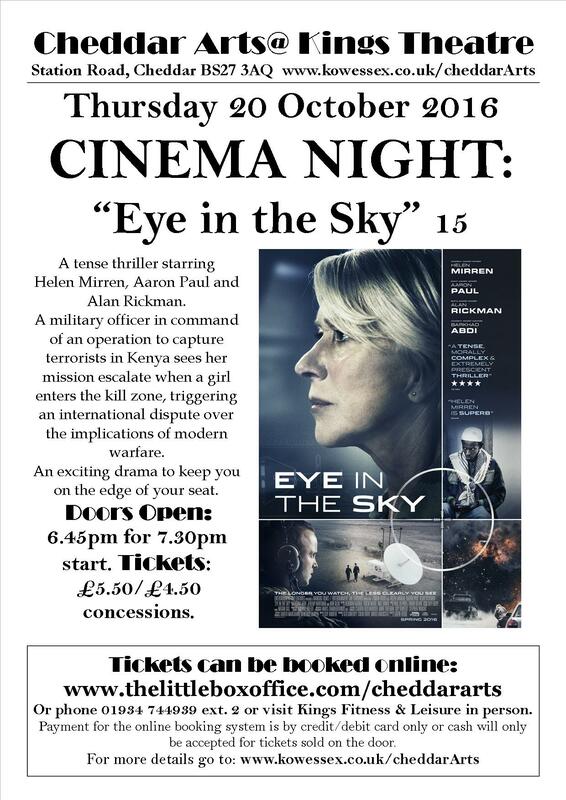 It is also the Centenary of the Royal Air Force & Votes for Women, so we explore Cheddar&apos;s links with these events. 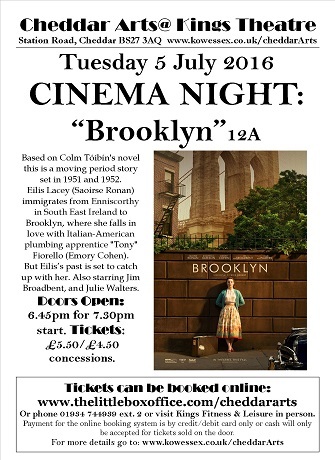 Over two Hundred Photographs will be shown on our Cinema Screen as a backcloth to illustrate the scenes. Many of the Village as it used to be, & touching images of local people who played their parts in Cheddar&apos;s history. 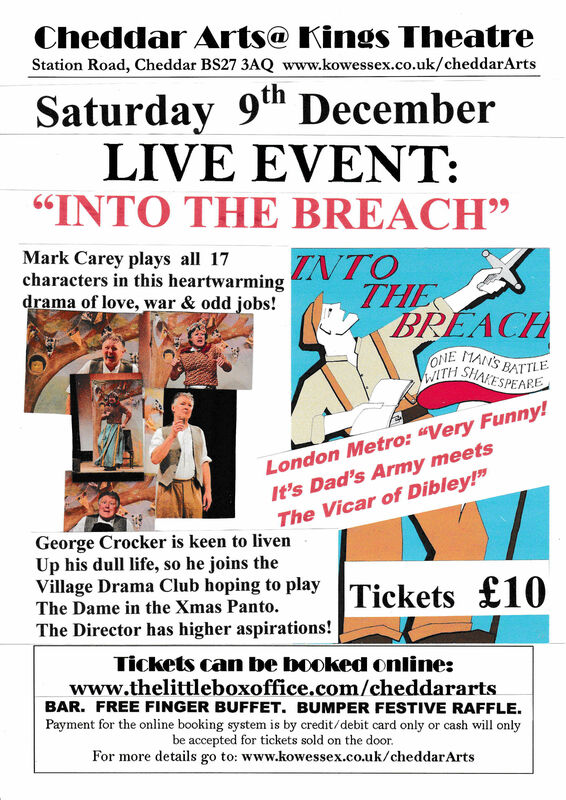 To add a different dimension to the play this time, Mark Carey a renowned Actor of the Stage, TV & Radio will join our cast to explore varied comedic & thought provoking characters from the era. 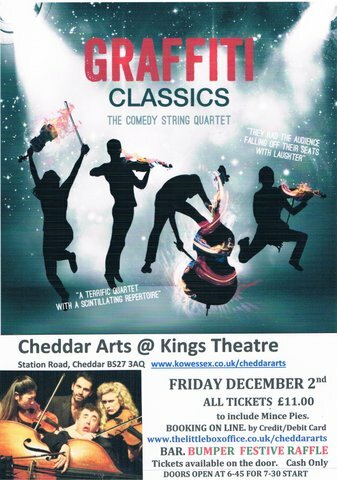 Add Songs & a Music Hall Act of the time & this play offers you a chance to see Cheddar as it was… & how it has developed to the present day. Something for everyone who loves this area & it&apos;s history. 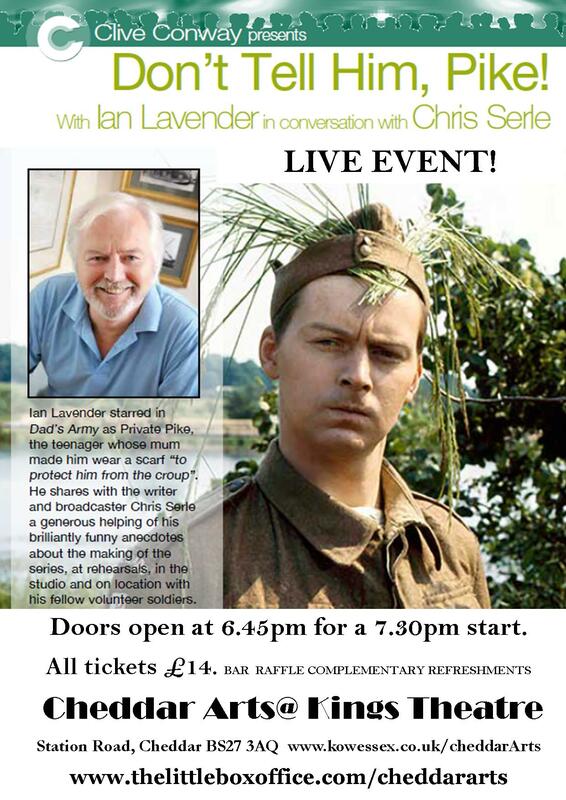 There will be a Bar, A Charity Raffle as well as a chance to chat to the cast & each other about one&apos;s own Memories of Cheddar. 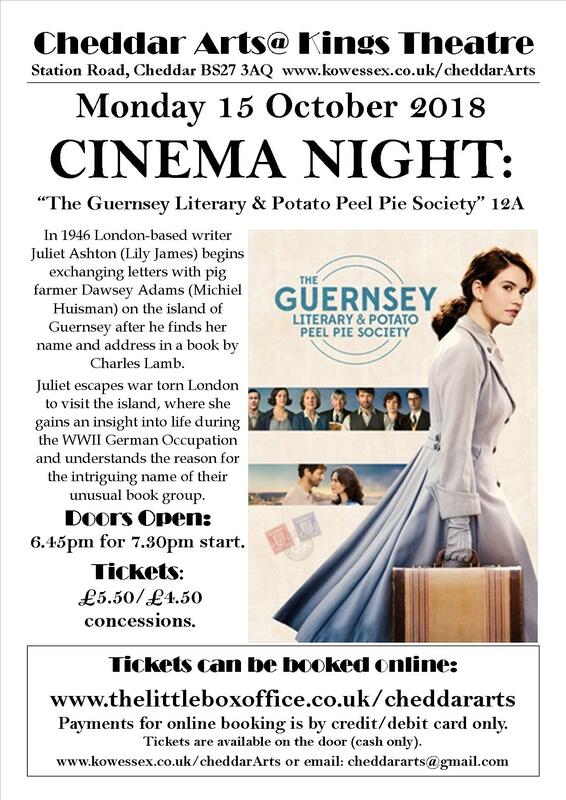 In 1946 London-based writer Juliet Ashton (Lily James) begins exchanging letters with pig farmer Dawsey Adams (Michiel Huisman) on the island of Guernsey after he finds her name and address in a book by Charles Lamb. 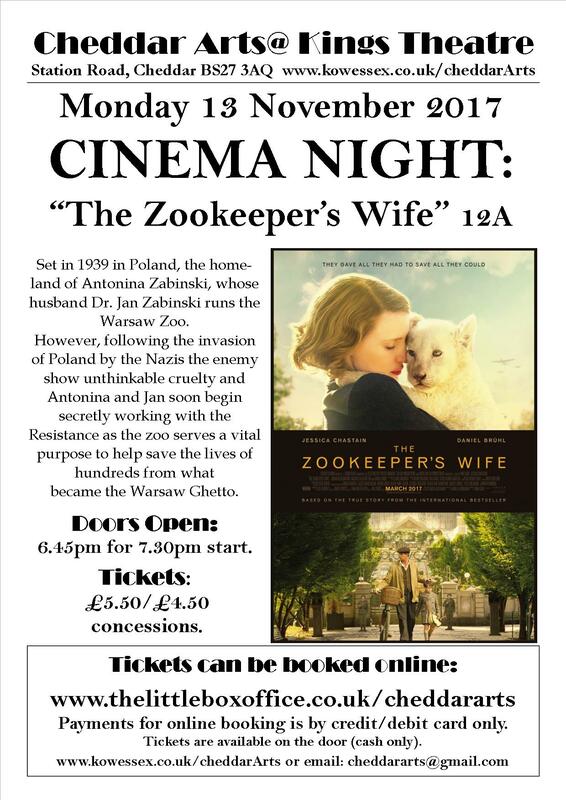 Juliet escapes war torn London to visit the island, where she gains an insight into life during the WWII German Occupation and understands the reason for the intriguing name of their unusual book group. 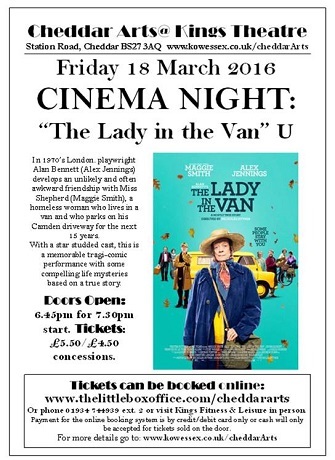 When "Lady" Sandra Abbott (Imelda Staunton) discovers her husband of 40 years is having an affair with her best friend, she seeks refuge in London with her estranged, older sister Bif (Celia Imrie). But the two sisters could not be more different. 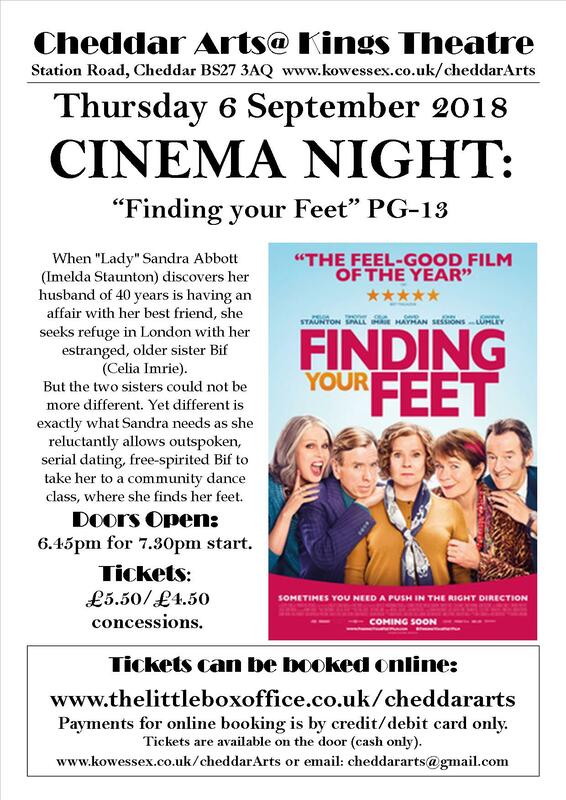 Yet different is exactly what Sandra needs as she reluctantly allows outspoken, serial dating, free-spirited Bif to take her to a community dance class, where she finds her feet. A thrilling and inspiring true story poised on the precipice of World War II. Within days of becoming Prime Minister, Winston Churchill (Gary Oldman) faces one of his most turbulent trials. 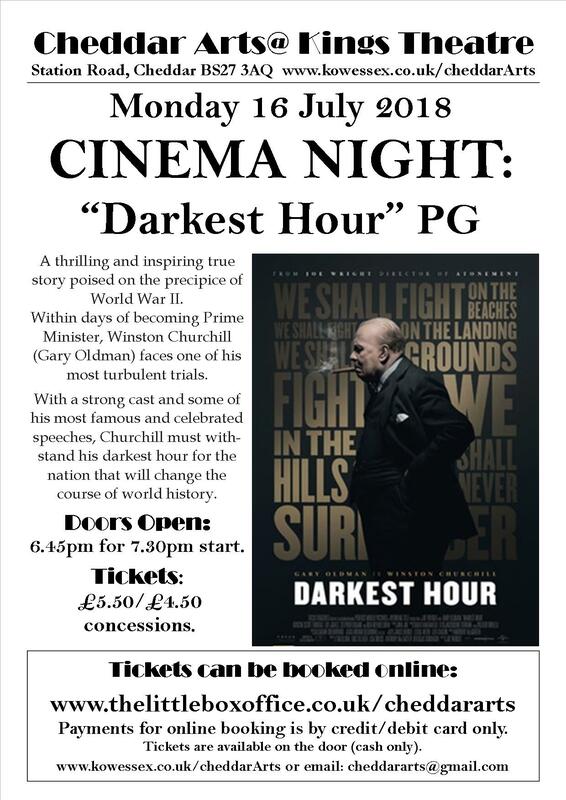 With a strong cast and some of his most famous and celebrated speeches, Churchill must withstand his darkest hour for the nation that will change the course of world history. 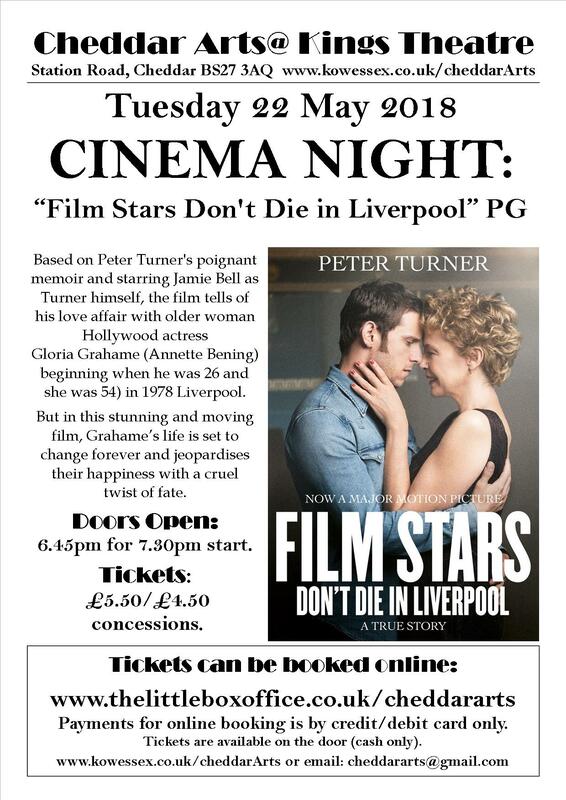 Based on Peter Turner&apos;s poignant memoir and starring Jamie Bell as Turner himself, the film tells of his love affair with older woman Hollywood actress Gloria Grahame (Annette Bening) beginning when he was 26 and she was 54) in 1978 Liverpool. 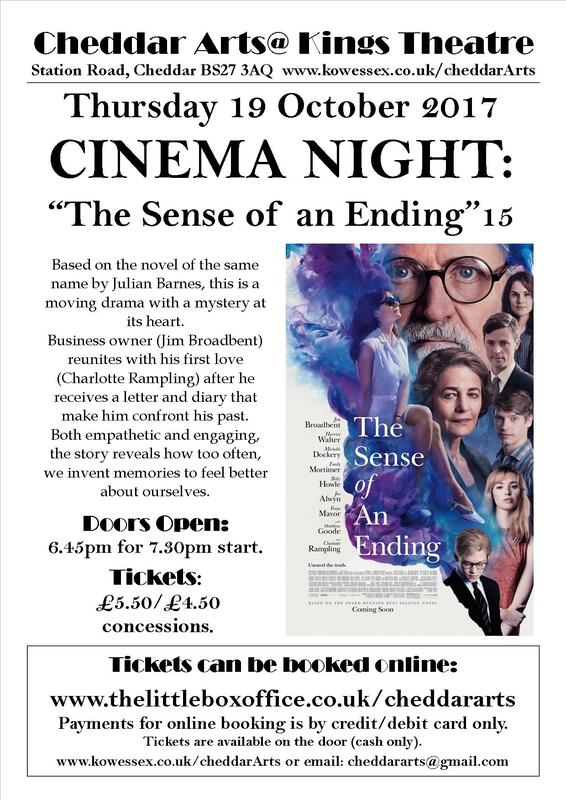 But in this stunning and moving film, Grahame&apos;s life is set to change forever and jeopardises their happiness with a cruel twist of fate. 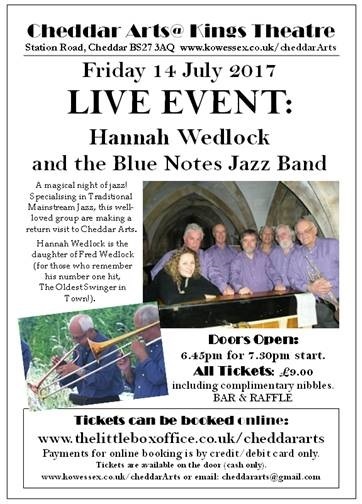 Join us for an evening of song. 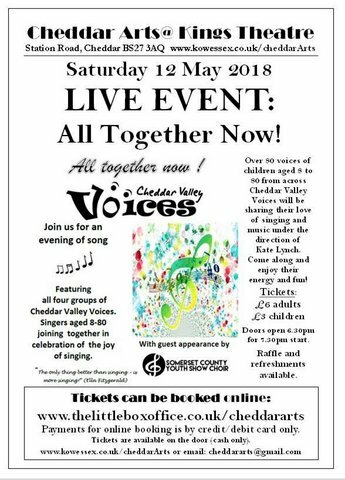 Featuring all four groups of Cheddar Valley Voices, singers aged 8-80 joining together in celebration of the joy of singing. 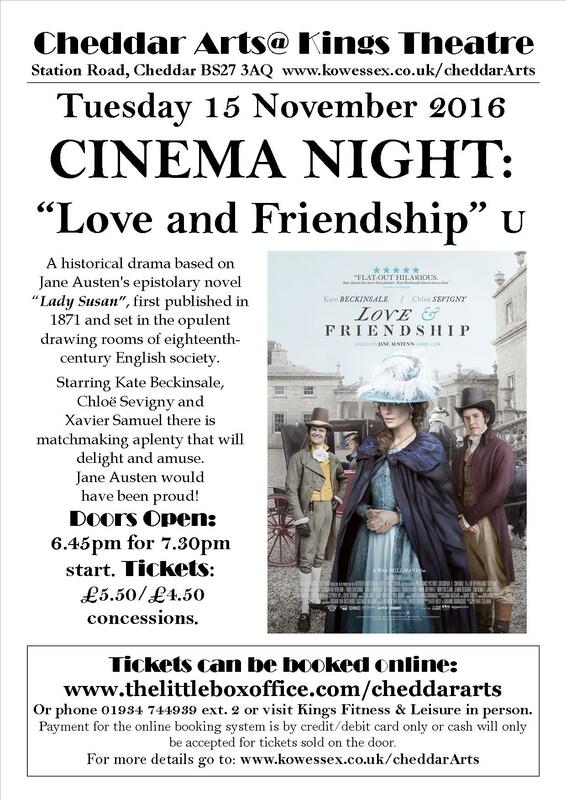 Over 80 voices from across the Cheddar Valley will be sharing their love of singing and music under the direction of Kate Lynch. 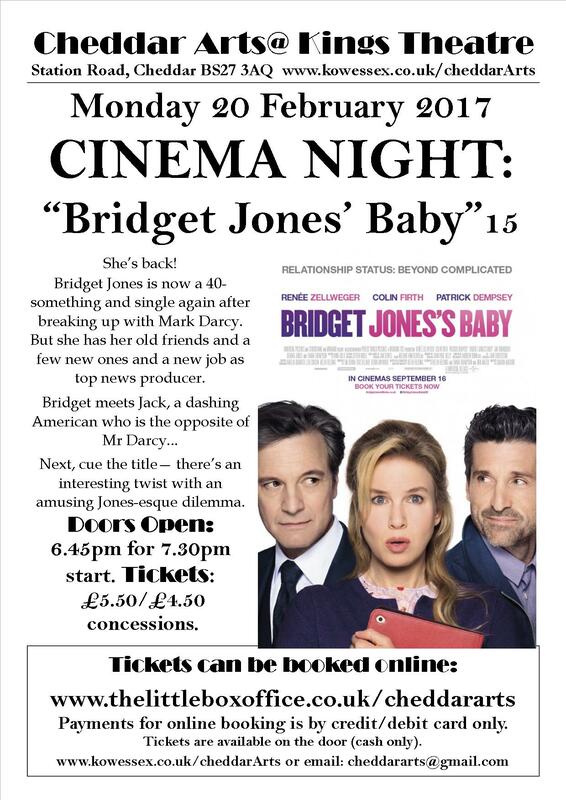 Come along and enjoy their energy and fun! He&apos;s back - the nation&apos;s favourite bear! 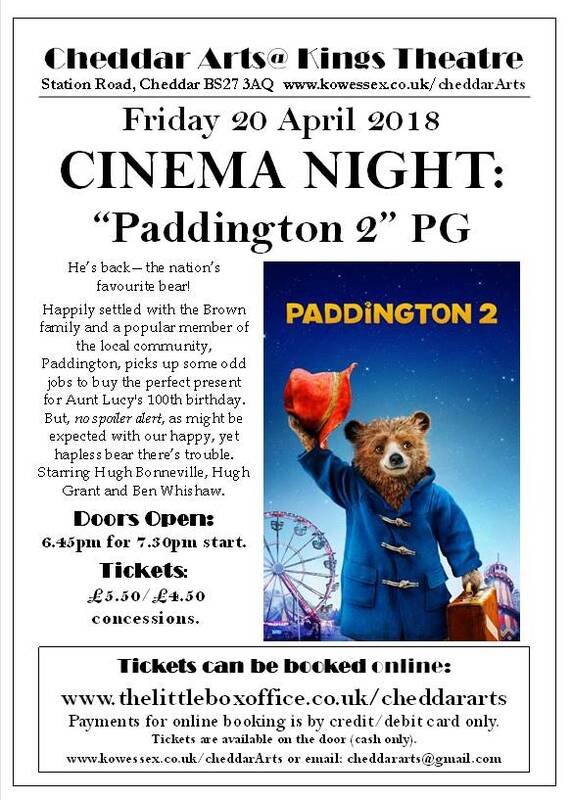 Happily settled with the Brown family, and a popular member of the local community, Paddington picks up some odd jobs to buy the perfect present for Aunt Lucy&apos;s 100th birthday. But, no spoiler alert, as might be expected with our happy yet hapless bear, there&apos;s trouble. 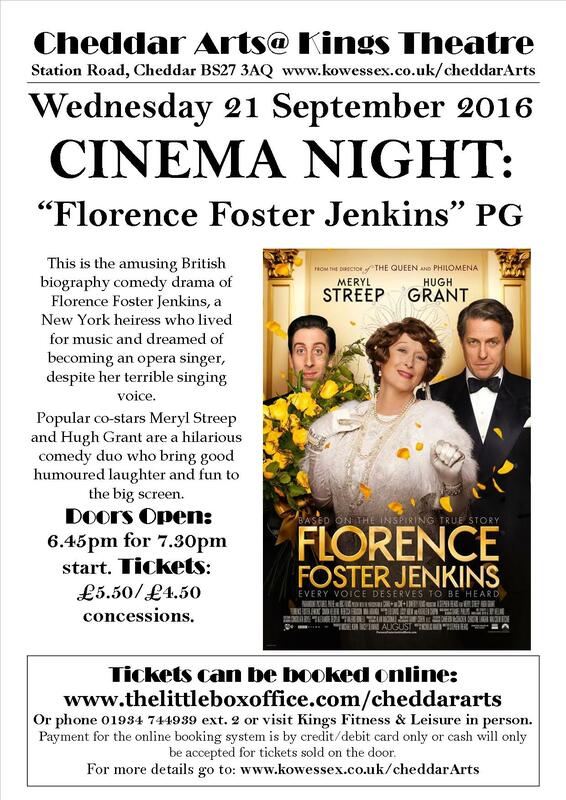 Starring Hugh Bonneville, Hugh Grant, and Ben Wishaw. 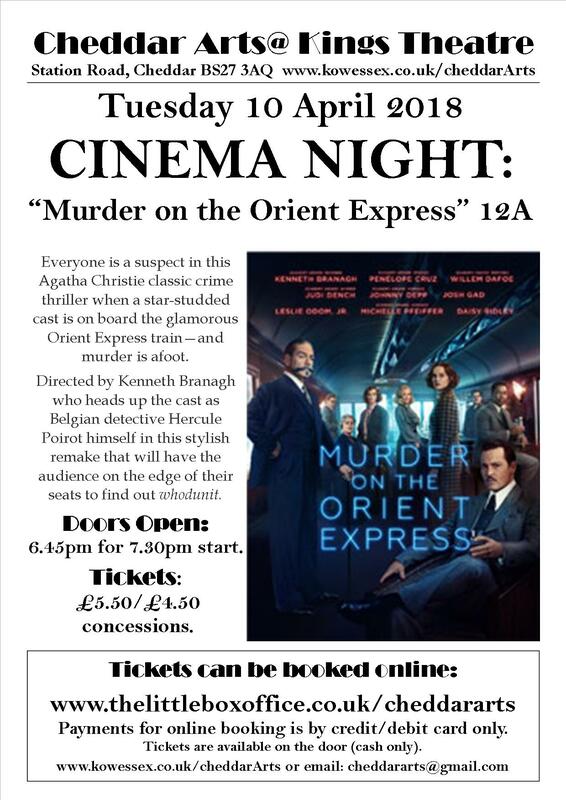 Everyone is a suspect in this Agatha Christie classic crime thriller when a star-studded cast is on board the glamorous Orient Express train - and murder is afoot. Directed by Kenneth Branagh who heads up the cast as Belgian detective Hercule Poirot himself in this stylish remake that will have the audience on the edge of their seats to find out whodunit. 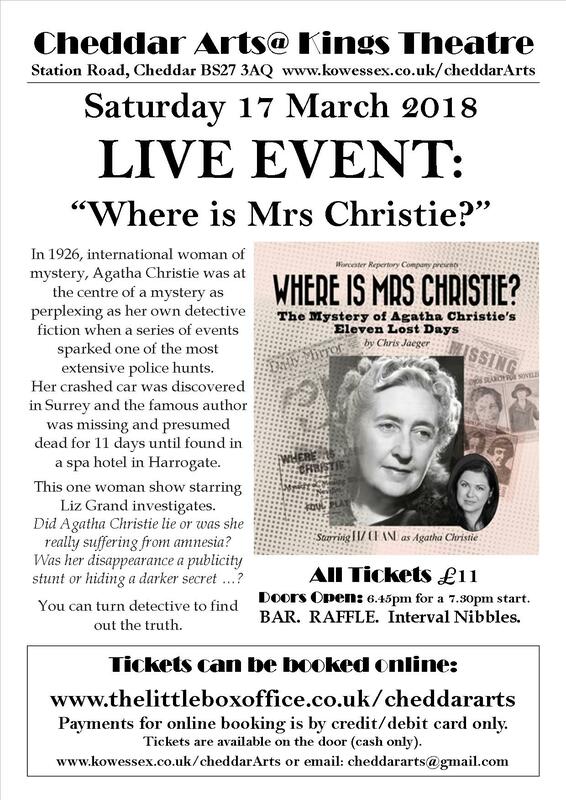 Agatha Christie is still one of the greatest & most prolific thriller writers of all time. 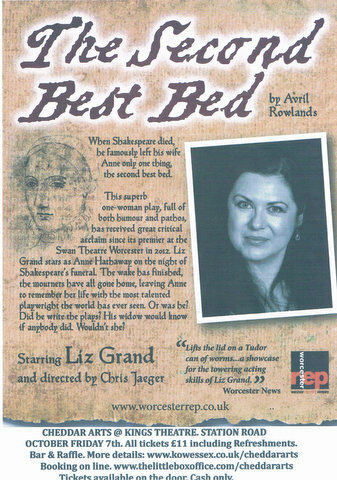 This One Woman Play starring Liz Grand (who dazzled us with her Tour de Force performance of Shakespeare&apos;s Wife in "The Second Best Bed" last year) explores the Authors real life mystery when she disappeared for eleven days which has never been explained. Did she lie, or was it real amnesia? Was it a publicity stunt? As in all good thrillers will the truth be revealed? 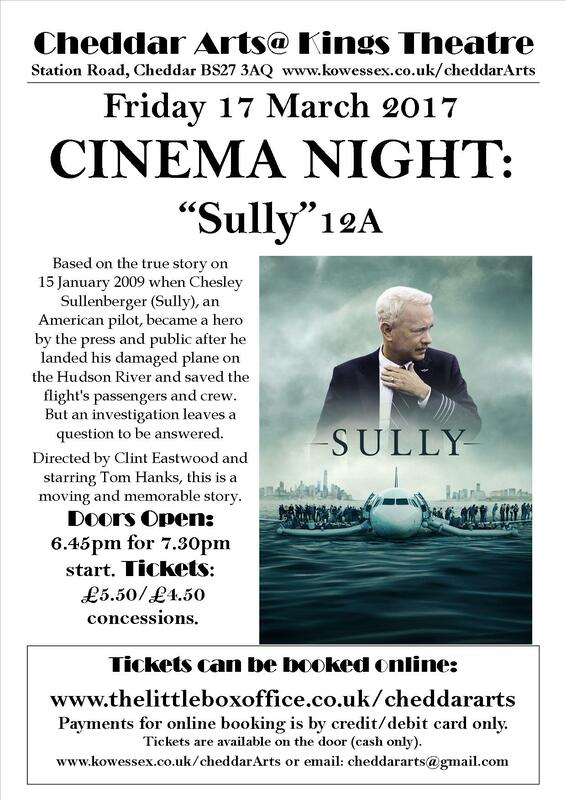 All tickets £11. Bar. Raffle & Interval Nibbles. "Oh Frig…. I&apos;m 50!!" 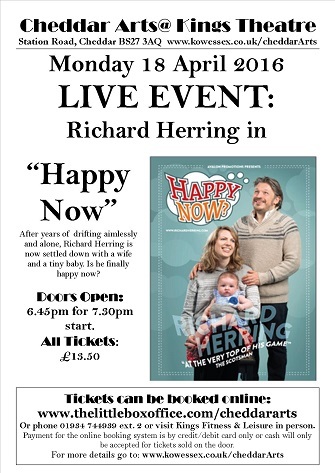 Richard Herring was a pupil at The Kings of Wessex in the 1980s whilst his father, Keith Herring was the head teacher. 30 years on he is a well-seasoned stand-up comic & writer of much renown. 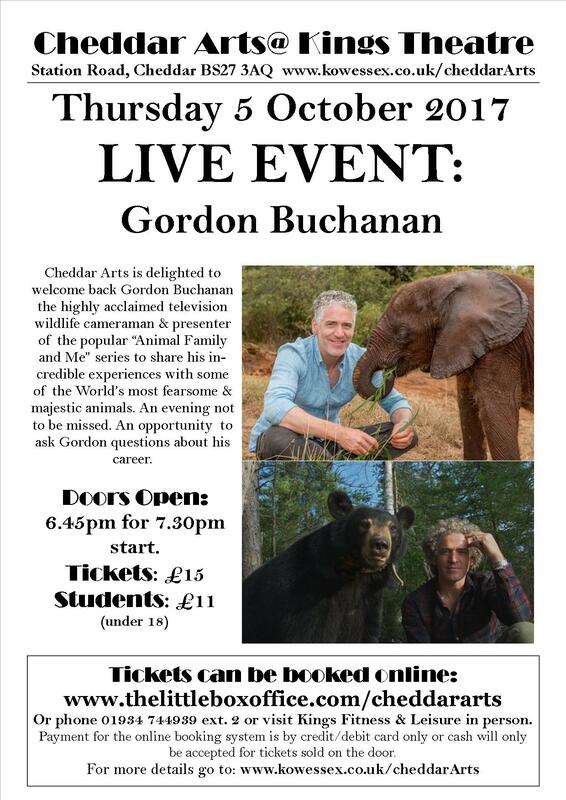 This will be his 8th visit to his "old school" for Cheddar Arts, & he has entertained… & indeed SHOCKED audiences with his opinions on many taboo topics. 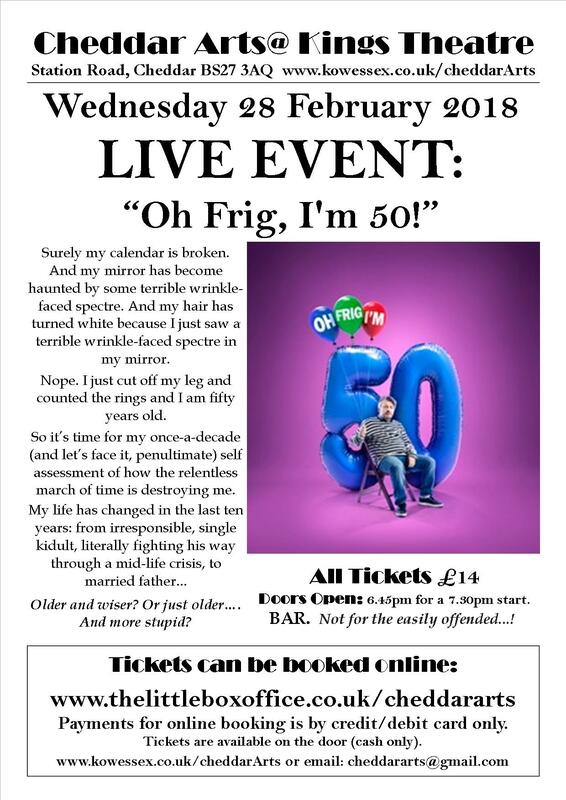 Now married with two children it has dawned upon him that he is now 50 which has made him look back on his life full of triumphs… & many mistakes. If you are easily offended this evening is not for you! 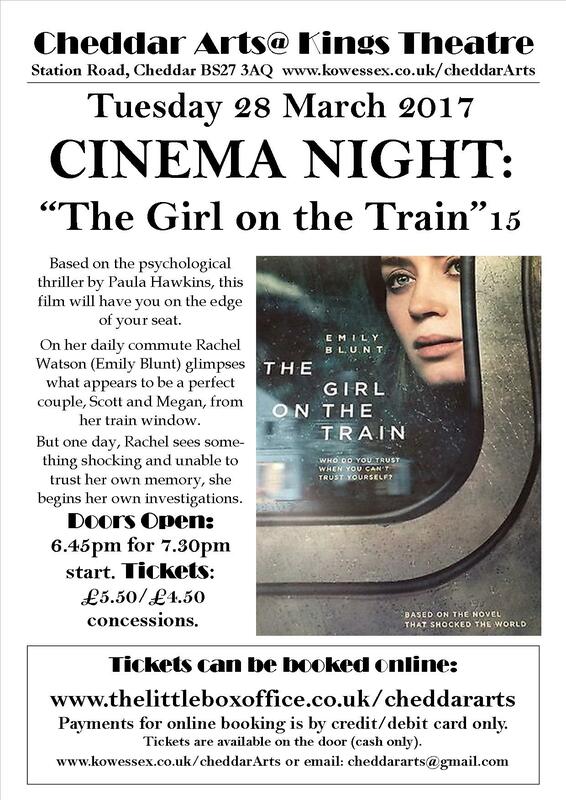 All Tickets £14. Bar available. 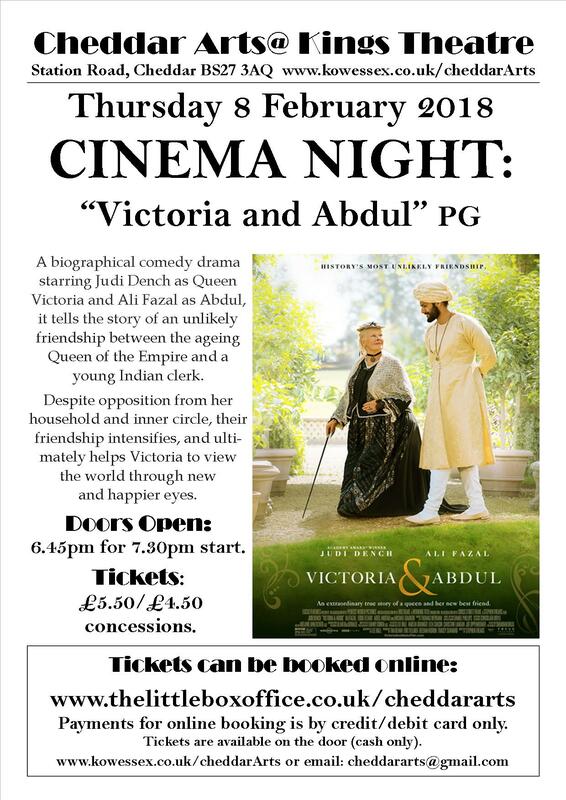 Judi Dench returns to one of her most famous roles as Queen Victoria & her extraordinary friendship with her Indian Muslim servant Abdul Karim. 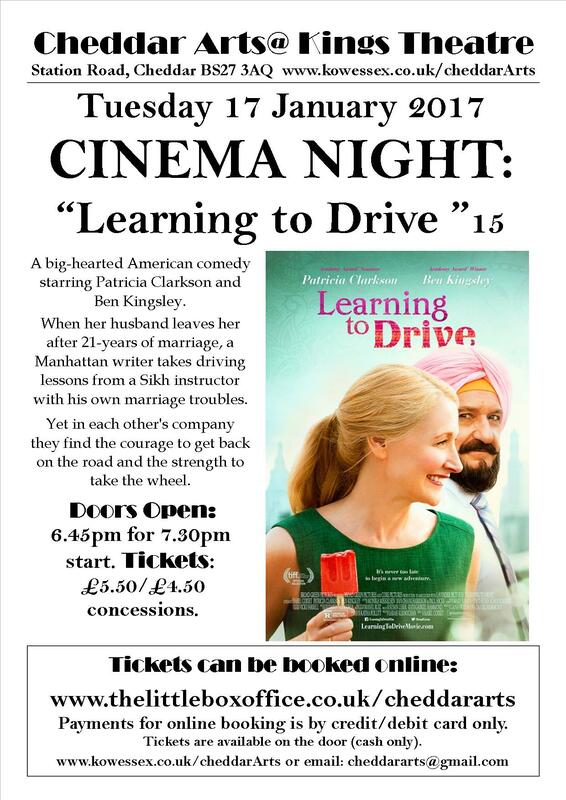 A delightful film with many comic moments which also highlights the subjects of Class & Racism. "Judi steals the show… as always!" 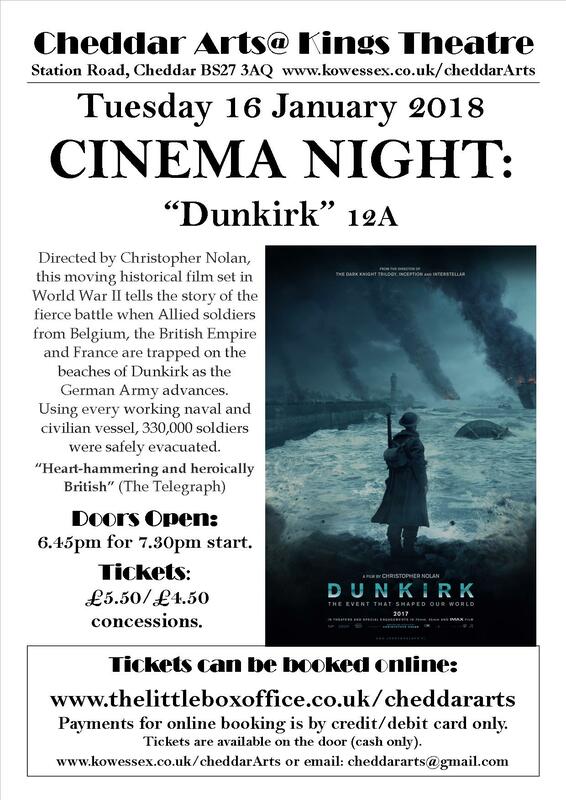 Christopher Nolan&apos;s latest film depicts the World War 11 evacuation of the Dunkirk beaches. A star studded cast offers a realistic view of this retreat without sensationalised scenes of "Gung Ho, Heroism & Over the Top" action. 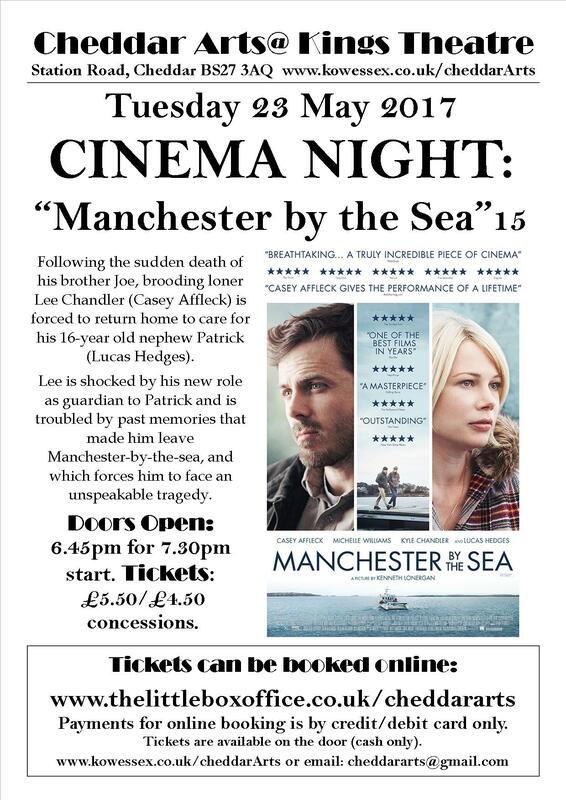 It follows stories of people involved in this historic event & it is a truly fine British Film in the tradition of "In Which We Serve" & "The Cruel Sea". 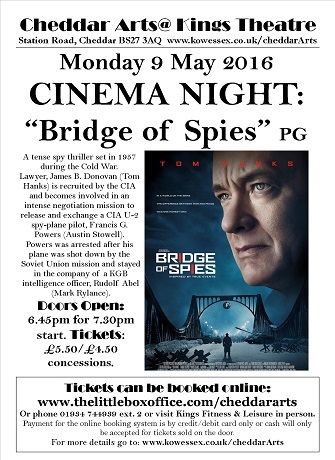 "A Masterpiece with Kenneth Branagh at the Helm."